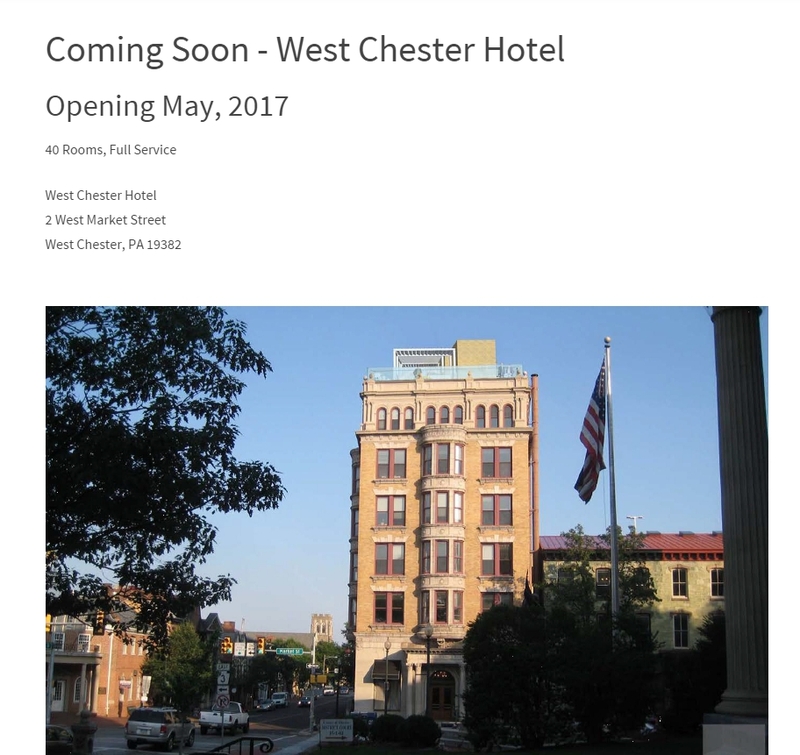 still coming soon in west chester? 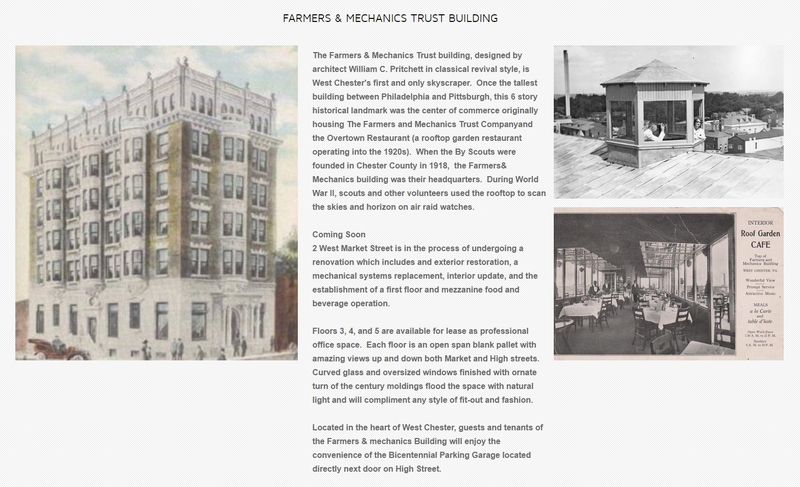 I love the Farmers & Mechanics Building and was super excited that Myles Development was thinking outside the box and creating a boutique hotel. As a matter of fact I had offered Tom Myles free photography of his site as it was being rehabilitated for a “brag book” I was so excited. But I never heard a thing after I offered that in February, 2016. And that’s fine, I am busy enough as it is. I went searching for news and found the above on a small hotel site called Marshall Hotels & Resorts. I saw an update that they are pre-leasing office space – that was on the Myles Development site and screen shot below. But that is it – can’t find additional media coverage or anything. 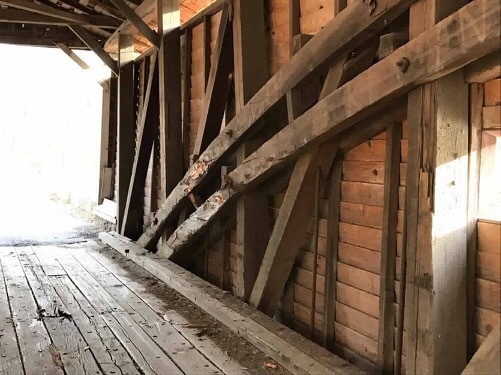 I am rooting for this project, so if anyone has any updates, please post a comment! Ah yes folks, the 2016 election will not be over anytime soon. 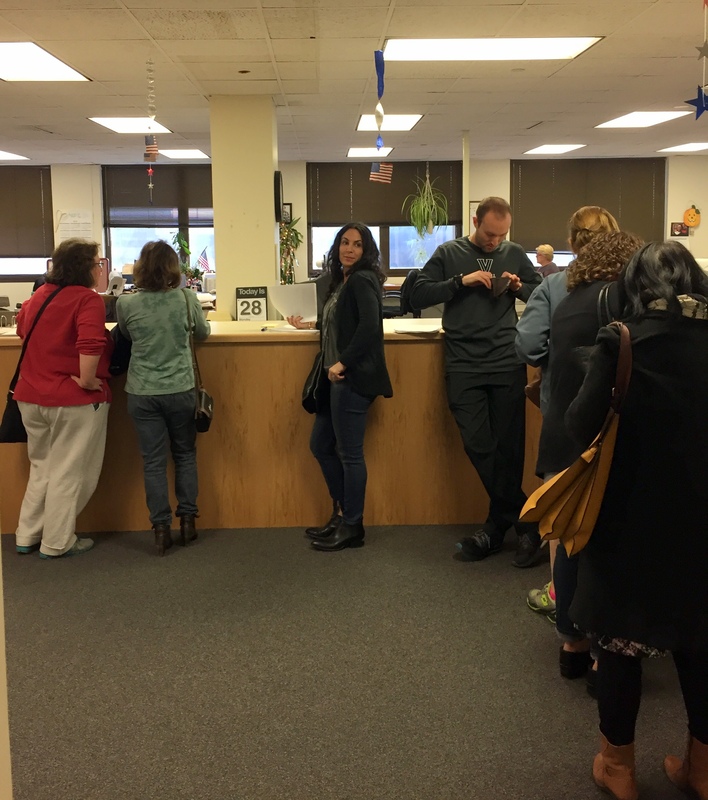 Today as I write this post, committee people from all over Montgomery County are poring into Voter Services in that county with legal petitions for RECOUNTS. Thus far the Montgomery County Board of Elections is REFUSING to accept the recount petitions according to my sources inside the building. 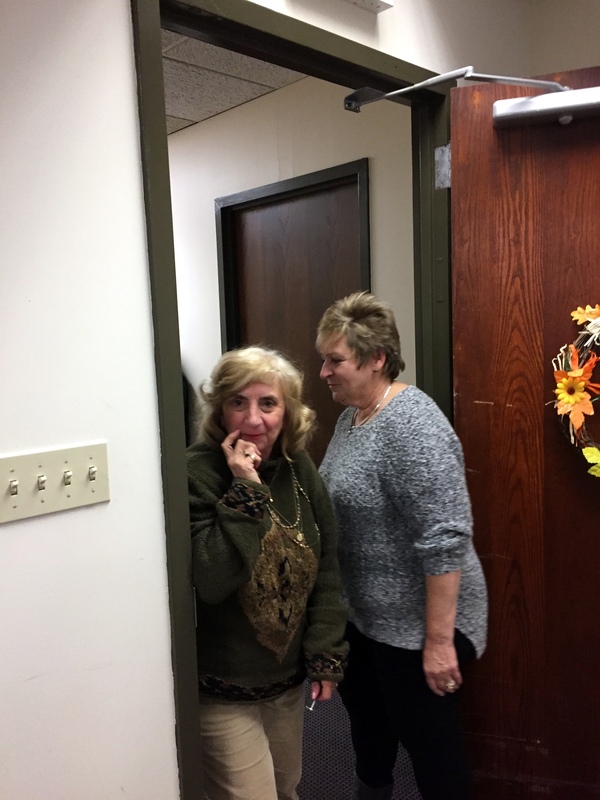 These are NOT court proceedings, although I was told there was some sort of hearing at 3 pm today on the election and that is why some people feel this push back in Norristown in this particular office is to stall for time, and is that nuts or what? Here is hoping someone gets this fairly in front of a judge today, right? There have been problems reported here for quite a while in this office and can it be said some people say since Josh Shapiro came in as a County Commissioner? And where is the PA Attorney General in Waiting during this hot mess today? Or Val Arkoosh who is not only Chair of the Montgomery County Commissioners now but the Chair of Montgomery County Board of Elections???? Asleep at the wheel much Dr. Val Arkoosh? And what about the Chief Clerk Lauren Lambrugo? What is she doing? Now I know Montgomery County folks have been up in arms because the absentee ballots were NOT even mailed out in a timely fashion. 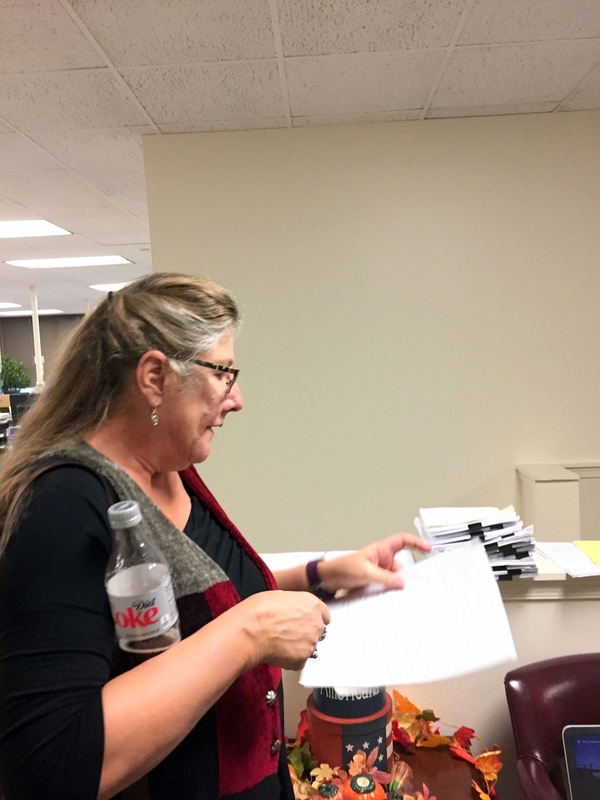 Now the County Board here has been claiming that the petitions need to go to prothonatary office then to judge, emergency filing with judge/court to order county election board to recount. But my sources which include lawyers tell me that in PA supposedly this is a layer not needed, the county board can accept the petitions so what the heck is is going on? Doesn’t every vote count??? 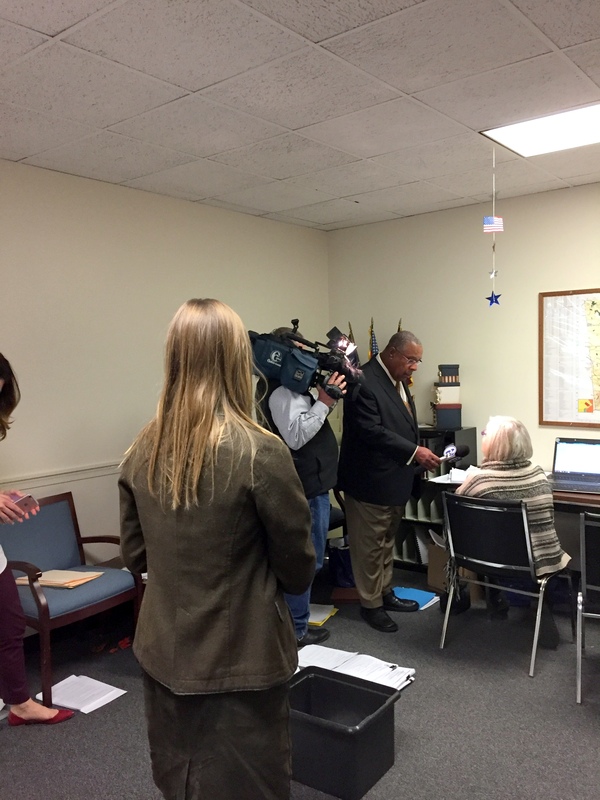 “I am so confused by this entire process at Montco Voter Services. My concern is multi-layered, and this office knew a recount was underway in the entire state, what is the delay at the counter? 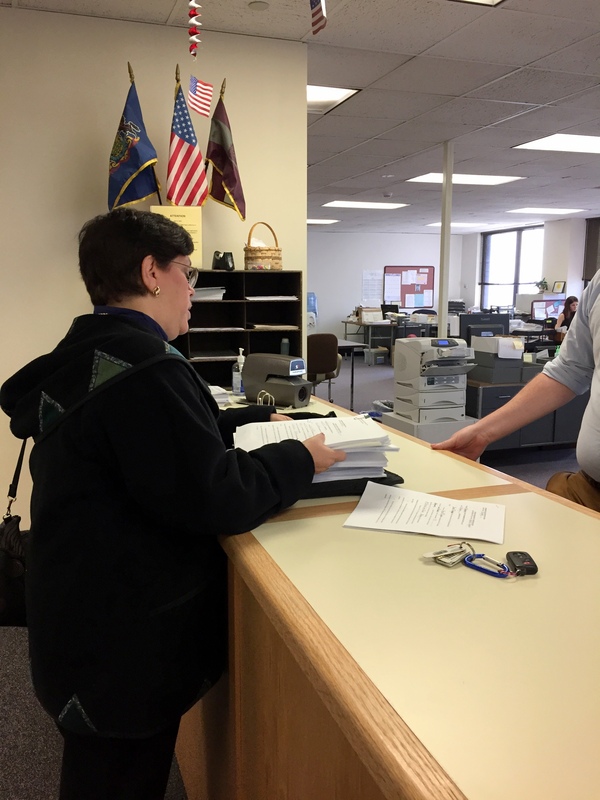 Why make petitioners literally wait all day? 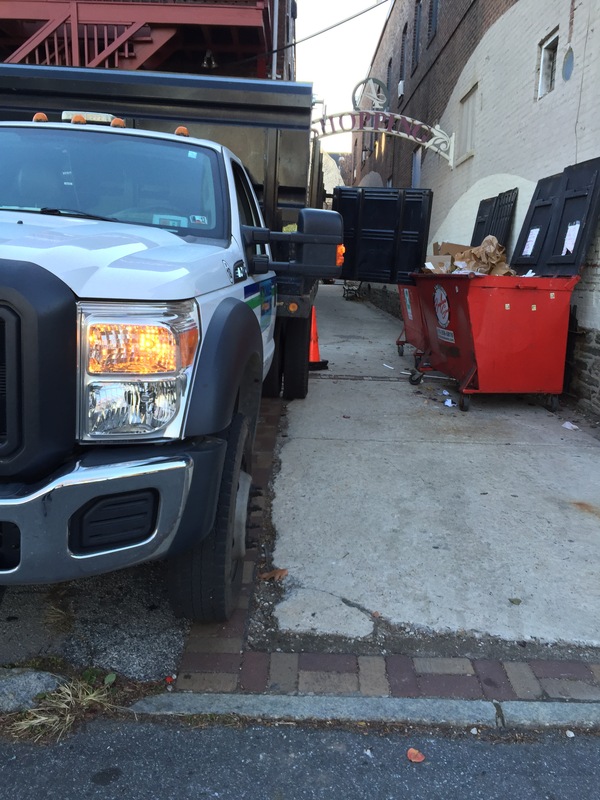 So is this just a case of they still need to take out the trash in Norristown or something deeper and more insidious? You see, this is not a Republican or Democrat thing, this is an all around voter thing. As a citizen, your voice is heard with your vote often if it is heard no other way. So if your voice is not heard because your vote is suppressed, what of our inalienable rights as Americans? Does every vote count only if certain factions allow it? Sign me glad I do not live in Montgomery County any longer. I also wonder if Val Arkoosh is fit to lead Montgomery County Solicitors? Can she be removed from office? And this opinion is nothing new…I had reservations when she tried and failed miserably at running for Congress. Oh and media was on site so I am not making this up and it will be on the news. It’s like Storming the Bastille today over there in Norristown for Pete’s sake! Today a padded media mail envelope arrived from Jenkins Arboretum. I did not know what it was because I wasn’t expecting anything. I am a member of Jenkins, but not a major donor by any stretch of the imagination. I love to garden, and I love to look at gardens. Because I now have a good deal of shaded and woodland garden, I have had a renewed appreciation of the genius and beauty of Jenkins. As a matter of fact some plants grown at Jenkins Arboretum are now part of my own garden. Anyway, want to know what was in the envelope? 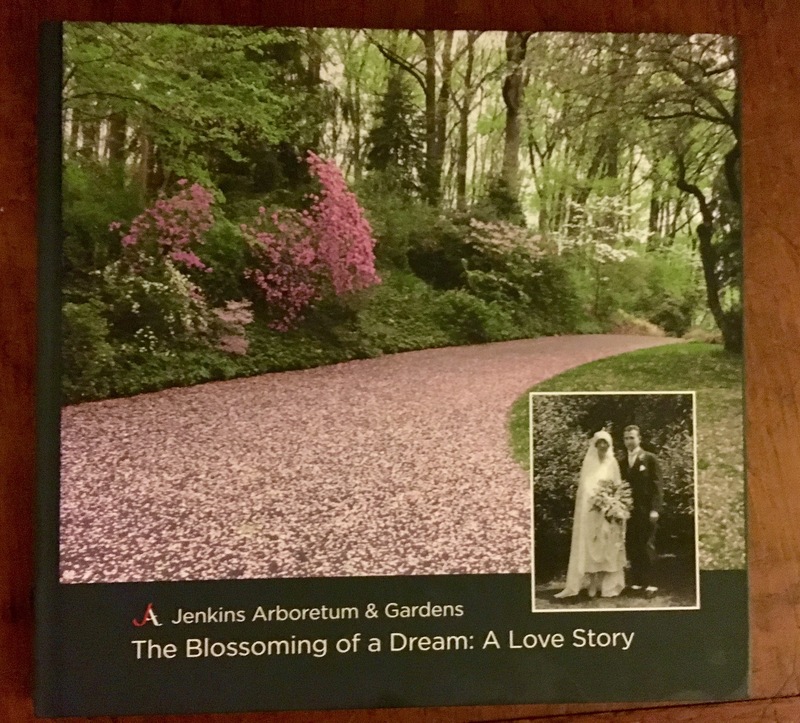 The most beautiful book, produced by Jenkins Arboretum about the history and legacy of Jenkins Arboretum on their 40th anniversary! 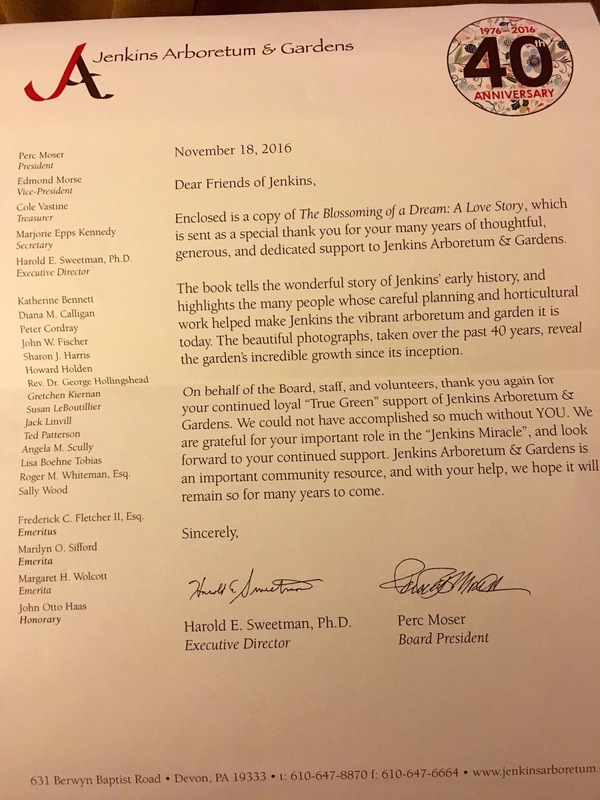 Thank you, Jenkins Arboretum, I will treasure it always! It has been a long time since I have received anything so nice or generous for just being a member anywhere. It is quite the gift and as a rabid gardener a most perfect one! Thanks for the added tension on the roads this evening. Like many others we were just driving home from a family Thanksgiving dinner and encountered YOU on 76 West (Schuylkill Expressway). When you sober up in the morning and you wonder HOW all that driver’s side damage occurred, I can tell you. 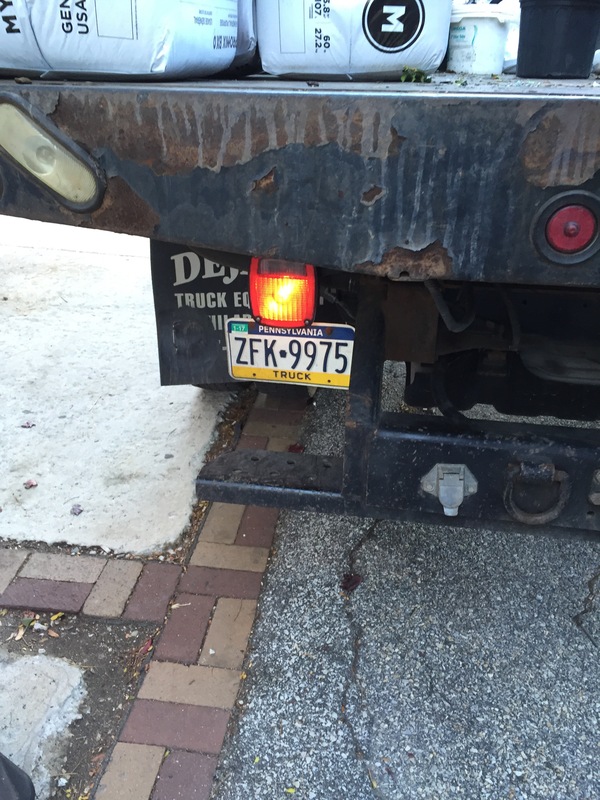 You bounced off the center concrete barrier on the westbound side of the Schuylkill. MORE THAN ONCE. We played dodge ball with what we believe was your driver’s side mirror as it flew by our car, narrowly missing our windshield. If you look at the above drunk driver, that fuzzy bright ball in the center is YOU. At different points of time, until we lost track of you, whether you were in front of us or behind us, or next to us (and we had to drive on the shoulder at one point so you didn’t hit us), you were not just weaving a little, but sailing left and right as well as riding the center line like a slot car. 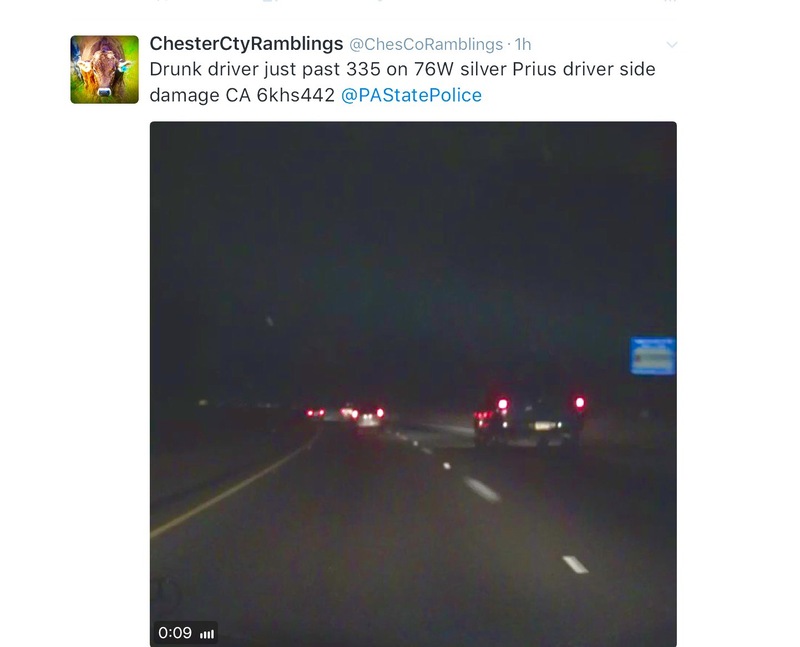 I did something I have never done before drunk driver because it had been so long since I had seen such a horrific drunk driver – I called the PA State Police. It was a busy night for PA State Troopers on the Schuylkill Expressway. Once past City Line Avenue, we passed several accidents east and westbound. So dear drunk driver, I don’t know if they caught you but I sure hope they did. More than anything else, I hope you did not hurt yourself or anyone else. The day before Thanksgiving and I’m starting preparations for dinner tomorrow. I’ve learned little tricks over the years like making the broth for the turkey out of the turkey gizzards and neck is easier done the day before. Once that broth starts cooking my kitchen is filled with the smells of Thanksgiving for the first time. Along with the smells of Thanksgiving come memories. I actually woke up this morning thinking about Thanksgivings of my past. When I think of the holidays I always think of my late father as well as my late brother in law because they both loved Christmas and Thanksgiving. When they were both alive Thanksgiving could almost be exhausting because they were perfectionists, but the meals were awesome! 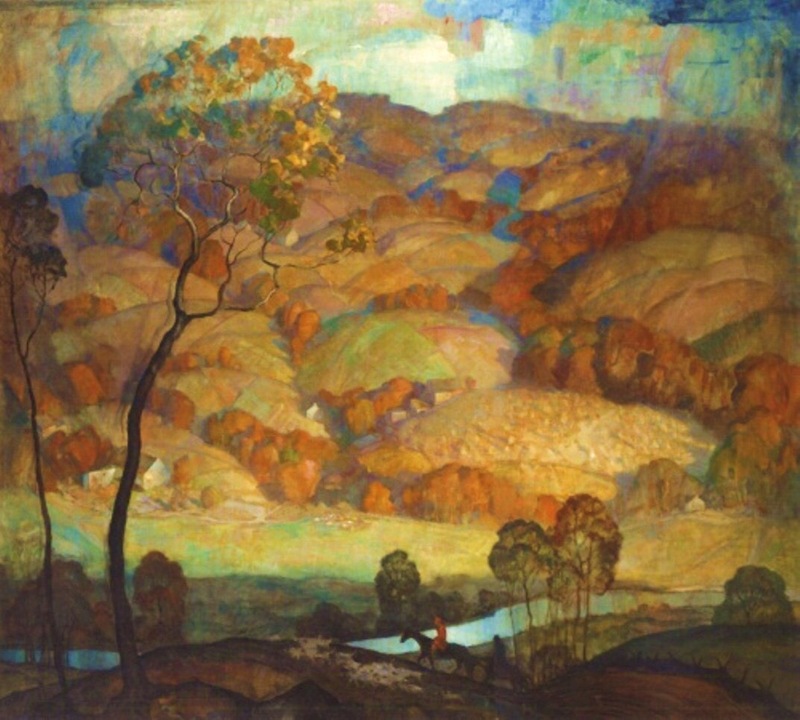 I have some very fond memories of Thanksgivings at my sister’s house in New York before my brother-in-law died. They have a beautiful dining room that is almost a square in shape so my sister uses two small tables that are round versus one large table. I think after both my father and brother in law being lost within a few short years of each other it has taken us a while to get our Thanksgiving groove back. When my sister and I were really little I remember going to my Uncle Jackie’s and Aunt Connie’s house for Thanksgiving. All of my cousins, us, aunt and uncle, and Mumma and Poppy. Due to family drama I don’t have very many memories of very many of these Thanksgivings. But those I remember being much more fun than the Thanksgivings we spent at my father’s sister’s house. My aunt, my father’s only sister, has never been an easy woman to read. I have always felt she didn’t like me very much or my mother and was jealous of my late father. She did seem to like my sister. Her daughters well, they were fine to get along with when we were little, but as we all grew up we did not have much to say to each other and still don’t to this day. I have a distinct memory again of when we were very little, and my Aunt Theresa and Uncle Serge lived in Paoli. Paoli was still a bit rural in spots. I remember they lived down a really long driveway in a white farmhouse. It was a really cool farmhouse and I seem to recall it was Victorian in nature. I don’t know that anybody has photos of it anymore but I have a distinct memory of a Thanksgiving there. It was a big crowd for dinner and I remember that the kids had their own table set up outside the dining room in the front hall by the staircase. I remember that we ate black eyed peas as one of the dishes. My uncle is Cuban, and I also remember his mother was still alive. Many years later we all tried the Thanksgiving together again with them when my grandmother – my father’s mother – was still alive. At this point my aunt and uncle had settled in Chestnut Hill where they still live today. I remember that Thanksgiving is being technically beautiful but emotionally cold. And I remember their dining room in their house in Chestnut Hill was quiet and dark, even in candlelight. I remember other Thanksgivings we spent with our family friends the Cullens. They had been our neighbors in Society Hill when we were really little and they first moved to Bethesda because Mr. Cullen’s job took him to Washington DC, and then later they moved to Summit, New Jersey because his job eventually took him to New York City. Growing up the Thanksgiving dinners we had with the Cullens are among my happiest memories of Thanksgiving as a child. Those were the holidays that were alive and boisterous and fun. Mr. Cullen was a tall Irishman with a big chest and a wonderful voice. And he was funny and he would say funny these things and you could just see the twinkle in his eye. Mrs. Cullen is still one of my favorite people on the face of this earth. She is one of the brightest people I’ve ever had the privilege to know and she is also probably the closest thing to Julia Child I will ever know as a home cook. The thing about Thanksgiving dinners with them is it bought out the best in everyone. Although Mr. Cullen like my father, died years ago now, the family remains dear friends. I especially liked the years they lived in Maryland because we would go down there for the weekend pretty much, and I would be able to wander around Georgetown while we were there and discovered fun things like Kemp Mill Records. That was this awesome record store in Georgetown where I listened to artists like Al Stewart for the first time. We had other Thanksgiving dinners that were just our family and smaller that were equally memorable. It was always fun getting the table set with my mother and laying out the flatware and the china, making sure the crystal glasses were all sparkle and no smudges. The good smells eminated from the kitchen all day until dinner time. Other memories of Thanksgiving include when I was in my early to mid 20s and my girlfriends and I would always go to West Chester for years the night before Thanksgiving. We would go to the Gobble Off at the Bar and Restaurant in West Chester. I have written about this before, it was just that much fun. Now we’re all purported grownups with our own families and that seems so long ago and far away. There were other night before Thanksgiving nights out with my friend Pam in Manayunk. I forget what the name of the restaurant is where we all used to meet in those days but it was a lot of fun as well. Pam would get all sorts of people together from high school and she made the evening fun! 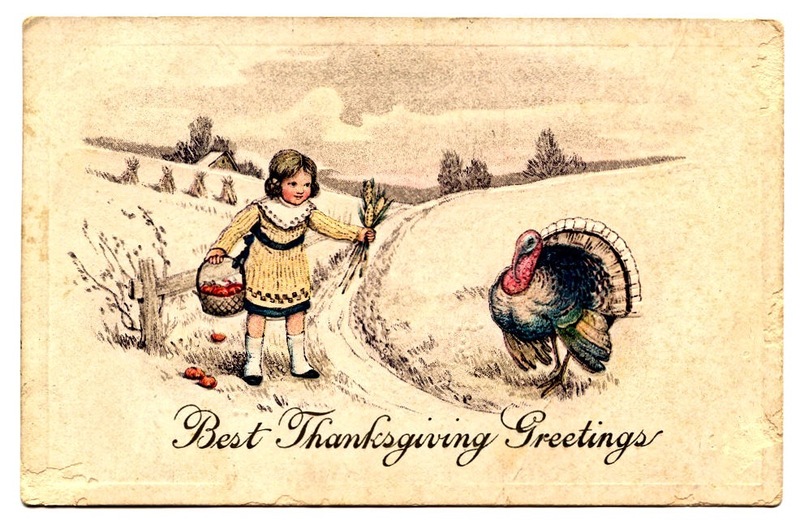 Along with the Thanksgiving memories are the years that were like being banished. It was because of a prior relationship that I used to have to go into Central Pennsylvania basically. It was like being a stranger in a strange land and sadly these were the people that were almost my in-laws. I just never quite fit. That made it hard before any of the other stuff. They weren’t bad people. One sister-in-law probably because she wasn’t related to the siblings by blood I liked in particular, still do. Before she divorced her husband (my ex’s brother) I honestly did enjoy going to Thanksgiving at her house up around Mechanicsburg. She and her mom were all about tradition and it was festive and warm. 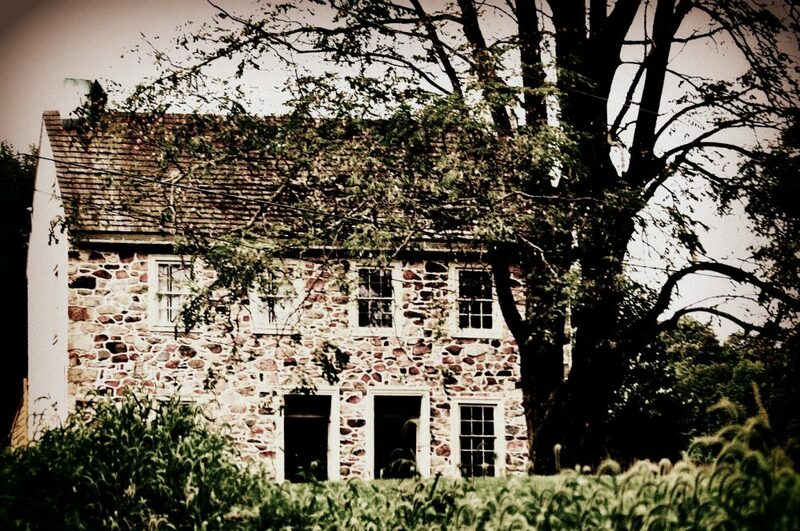 But the majority of the years I spent going to another almost sister-in-law’s house outside of Allentown. That was not so much fun. The entire car ride up my ex would berate me about one thing or the other. Usually he yelled. Why was I wearing what I was wearing? What I could say and what I couldn’t say, and basically the entire duration of our relationship he didn’t want me getting too close to his family and didn’t share the few friends he had. It was always an unpleasant ride up. By the time I got to his sister’s house I was a bundle of raw nerves. When we got to his sister’s house, which was a townhouse development on the edge of a golf course, we would circle around for parking and eventually find the spot he deemed suitable. Then we would haul in my contributions to the meal. And we generally speaking, well that was me. When you got inside the townhouse you had the welcoming smell of a Thanksgiving dinner. Unfortunately you were also met with some pretty somewhat bitter and somewhat dissatisfied middle-age women all divorced older than myself. The nieces and nephews were nice when they were in town, but I couldn’t hang out with the kids I was one of the grown-ups. One of the most amusing part of those Thanksgiving dinners in exile was the way every year the one sister magically made photos of my ex’s ex-wife fall out of the drawer or a book somewhere. And I also never understood why they went to the trouble to cook a beautiful Thanksgiving dinner and have people around the table and not put the food out in nice containers. They put the disposable aluminum pans and plastic containers and what not right on the sideboard. The Thanksgivings I spent in exile so to speak made me appreciate my friends and family all the more. Not every Thanksgiving is perfect, we’re human they are not supposed to be. And even on the Thanksgivings that don’t quite end up the way you envision there is always good. Or at least humor. I think we all have this goal to become like a Norman Rockwell painting for one day. The problem is we can’t help but fall short because we are actual people not subjects of someone’s artistic mind’s eye. I love hearing about my friends’ traditions. I woke up this morning thinking of someone I used to know who always spoke about making creamed onions in a sherry cream sauce every Thanksgiving. Now sprinkled in between all the homemade Thanksgiving dinners were a couple club and restaurant made Thanksgiving dinners. Those were beautiful dinners and we had a lot of fun, but it was sort of anti-climactic because you didn’t wake up the next day to Thanksgiving leftovers and that is part of the fun of Thanksgiving. I think Thanksgiving is a holiday is something I enjoy more the older I get. I don’t know if that makes any sense. I think part of it has to do with feeling somewhat like I have come into my own. But I do love Thanksgiving and even more so, Christmas. I am the crazy person that likes to put out the china, iron and do up the old table linens, and decorate and cook. We all have a lot to be thankful for, even if it is not always immediately apparent. Hearth and home are powerful motivators. My wish for this Thanksgiving is as a country we start to put aside all the political divisiveness of this recent presidential campaign, and remember what it is to be an American. I don’t know about you but I am tired of all the hate and violence. I am tired of the protests. I am tired of the anger. It’s exhausting even to avoid. I hope everyone takes a breath tomorrow and enjoys the company they are with. tomorrow literally is the day to be grateful for what we have and who we have in our lives. Well I have to get back to my meal preparations, because when you’re a kid you don’t realize the preparing Thanksgiving dinner actually takes a good couple solid days of work! Wishing all of you my readers, a safe and happy and blessed Thanksgiving. Things that happen to small businesses that I hate. 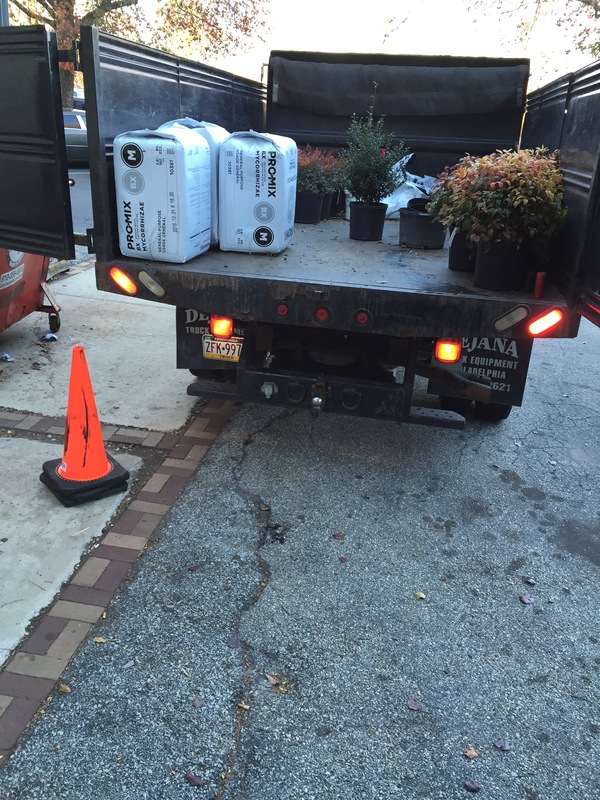 Not in Chester County but my old stomping grounds of Ardmore, PA.
Now this is the Main Line so of course you have to hire someone to plant a couple of plants in a planter, right? Well that is fine provided said service provider is NOT blocking public walkways, rear business entrances, and oh yes parking in someone’s posted private and non-municipal parking. 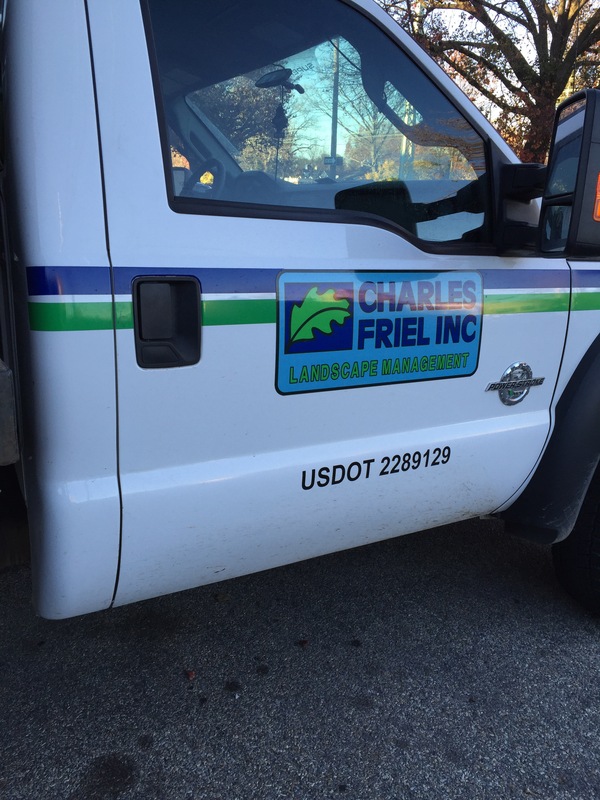 Well completely disregarding all of the above award of the week goes to Charles Friel Landscaping. They did this to one of my closest friends who is a small business owner. And when she went out to basically ask him to move he was like he would be done soon and he had these plants to get in. My friend kept trying to explain that the guy was blocking her rear door (fire and safety hazard), parking in her customer parking on private property, and blocking a public walkway. That is not right and for some reason he could not tell her who had paid for the planters (don’t people usually know for whom they are working?). 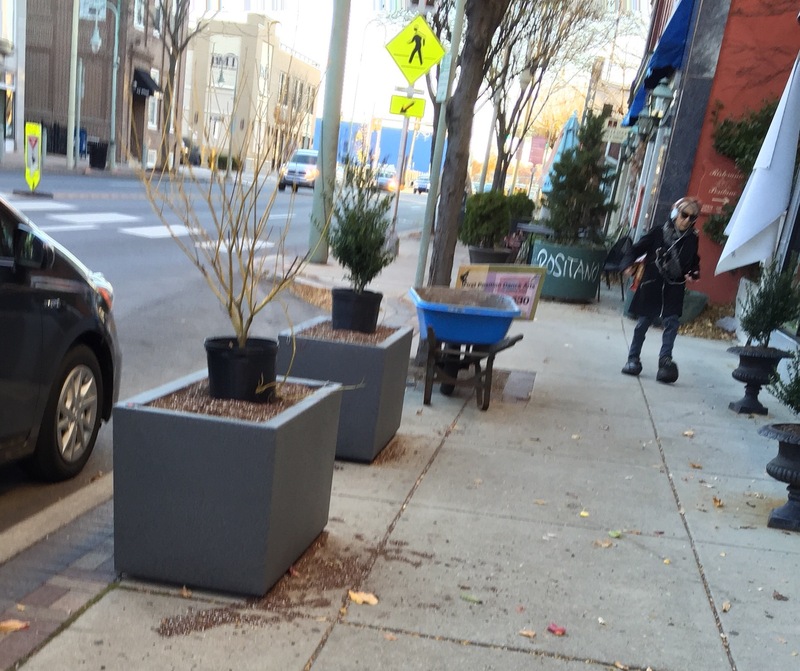 None of the businesses (even the ones with them in front of their stores) seem to know where the big plastic planter boxes have come from. I am all for community beautification in business districts as so many business districts just don’t bother. But what I am not for our people who do things like this landscape truck did today. Ardmore is horrible for parking. It gets as congested as the Borough of Malvern or downtown West Chester. But people need to be considerate of small businesses. These mom-and-pop shops make our communities unique and careless behavior like this literally takes business away from them because of people can’t get to the store they’re going to go someplace else. 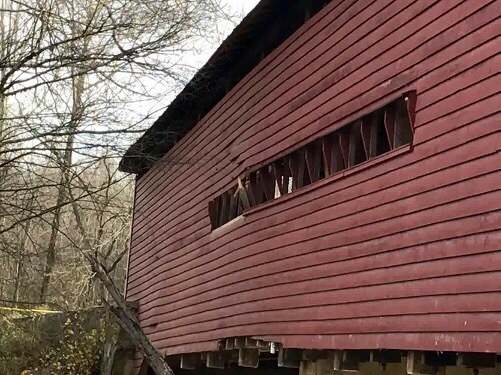 Boards were dry at time of accident. 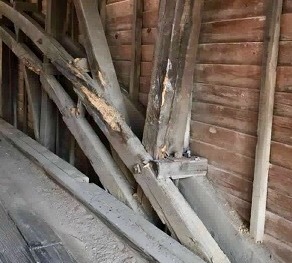 Speed and uneven boards were the problem. Someone else was kind enough to send me some photos today. Except for the one above I have cropped them in a little so people can see the damage that occurred with the accident over the weekend. 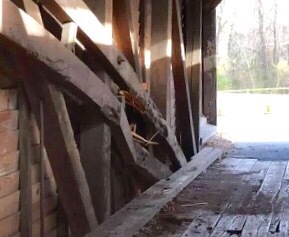 This particular photographer and I were discussing how someone would wedge their SUV in the middle of the bridge, and we came to the conclusion that there must’ve been some kind of speed involved, and quite possibly someone both unfamiliar with the road and driving on wooded covered bridge surfaces. 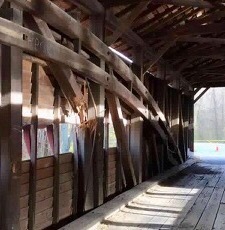 I know for example when we go over a covered bridge, we treat the wood surface with respect and go slowly. A lot of people don’t – they fly. You combine that with Saturday’s weather conditions where we had had our first freezing rain/sleet of the season and even though the road surfaces were too warm for anything to stick long-term, it could’ve very well made everything quite slick. Or at least the road leading to bridge. I hope the people who were in the accident are OK – I don’t know who knows which ambulance company responded or if the people went to a hospital. I also hope that the people who were in the accident we’re not impaired in anyway because that will make this an even more expensive accident for them. I am told PennDOT was out today. Thank you blog friend for the photos!